Up until very recently, I hadn’t touched a Legend of Zelda game. That’s mostly due to the fact of never really owning a Nintendo console, which all changed fairly recently with the launch on the New 3DS. Ocarina of Time was my first stop, and I was simply blown away by the sheer quality of a game that was created more than a decade ago. The Legend of Zelda reignited an addiction I haven’t had with a gaming series in a long time, and Majora’s Mask just served to intensify it. Much like Ocarina of Time, I hadn’t really heard of Majora’s Mask up until the massive announcement last year. The game stands as a confusing and different entry into the series, created over 15 years ago for the Nintendo 64. Its use of a groundhog day, time rewinding mechanic still stands as an incredibly unique one, although you’ll find it difficult to avoid comments of the system being repetitive and imperfect back when the title first launched. The revamped, remastered 3DS edition does a lot to alleviate these small annoyances, and in turn delivers a truly unforgettable adventure. 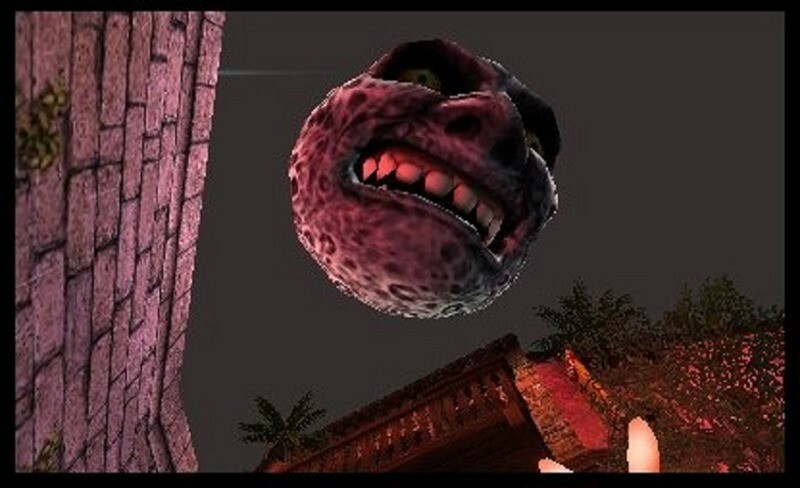 Following on directly from Ocarina of Time, Majora’s Mask follows Link once more as he races to save a town with a gigantic, nightmarish moon quickly falling towards it. The Skull Kid, a tragic figure that epitomises the game’s rather dark and unsettling tale, has stolen the infamous Majora’s Mask and is using its power to bring about the end of a city that forgot him. There’s simply not enough time to stop him in the three days that introduce you to the game – so it’s good thing Zelda let you hang on to that Ocarina of Time then, isn’t it. With it you’re able to transcend time itself, and open up the real meat that the game has on its bones. Majora’s Mask repeatedly forces you to rewind the three day cycle over and over again until you’re finally ready to take on the Skull Kid, and it presents an interesting way of telling stories. It’s seen best in the games rather expansive and numerous side-quests, which all depend on timed events. Be in the right room at exactly the right time, and you’ll witness a conversation that kicks off another timed event down the line. Foil an attempted robbery and gain access to equipment that you get to keep forever. Or just memorise lottery numbers so that you can cheat the system endlessly. The game plays around with this time mechanic and bends the rules here and there to keep things fun. Every time you hit rewind you’ll lose non-essential items, which usually boils down to everything but weapons and bottles. Got a quest item that you needed to hand in? That’s gone. How about a quiver full of 40 arrows? Cheers. It sounds infuriating, but over the thirty hours I spent with the game I eventually learnt tricks to keep pushing forward without having to grind things out during every cycle. It’s a testament to phenomenal design – and it’s the one bit that Nintendo actually didn’t mess with. This is a game that was so expertly thought out years ago, to a degree that most modern games would envy. That doesn’t mean that some annoyances don’t creep in here and there though. 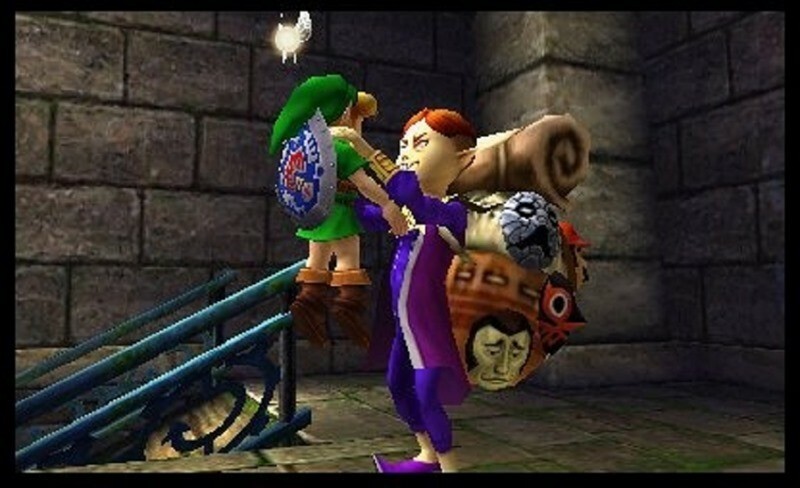 Majora’s Mask was criticized for being repetitive back when it first launch, and it’s still the case on occasion here. Although, most of the time, it’s due to a lack of your planning. For instance, I was forced to fight an end of dungeon boss again because I simply failed to complete the entire quest in time. I needed to go claim a reward straight after the first fight, which just so happened to end a few short hours before I needed to reset. Thankfully any dungeons you’ve already run through allow you to skip ahead to the boss on a replay, but it ended up messing with the entire three day cycle I had planned. Annoying, but not entirely the game’s fault. There’s a lot going on in Majora’s Mask at the best of times, and since the clock is constantly ticking away it can feel overwhelming at first. The Bomber’s Notebook alleviates a lot of that stress though, with the upgraded version acting as a handy quest guide of sorts. It logs rumours you’ve heard, missions you’re currently doing and schedules for any timed events you may have come across. You can even set an alarm (although, only one at a time) to make sure you don’t forget about a crucial meeting, which helps when you’re in the middle of chasing after the mail man or clearing a cave full of Skulltulla. Another handy tweak that helps the panning process is the ability to both slow down and fast forward time. The Song of Double Time allows you to fast forward to a specific hour in the day, which helps when you’re just sitting around waiting for an event to trigger. Slowing down time is even more useful though, and can seriously save you a cycle if you’re on the verge of completing a quest just before the moon plummets down on the clock tower. Both of these are modern additions to the 3DS version to help alleviate some of the biggest annoyances of the original, and I can see why it would be infuriating to play without them. It does, however, tend to make things a little too easy at times, which diminishes the feeling of an imminent threat looming. 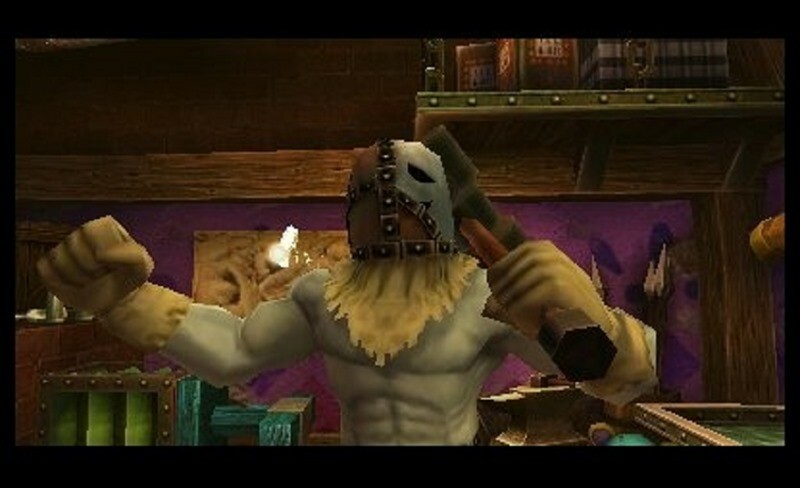 But there’s more than enough of that when you’re busy tacking some of the main story quests you’ll need to complete to take down the Skull Kid. The formula is relatively the same here, although seemingly much smaller. There’s still four main dungeons to beat, with all four featuring unique challenges that you may or may not yet be prepared for. 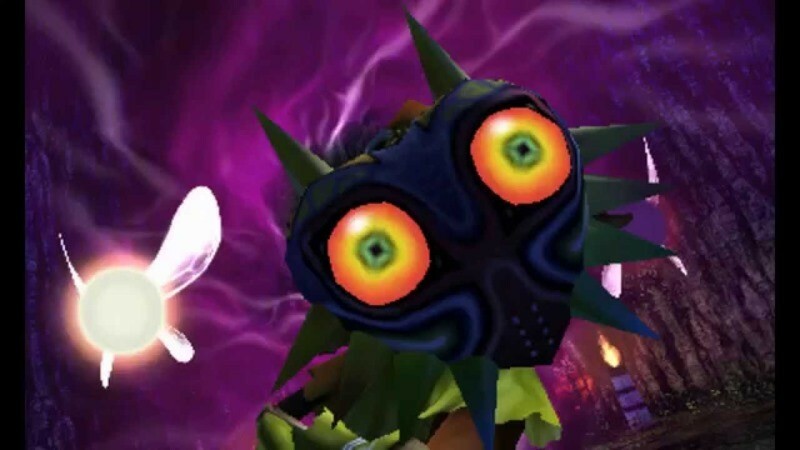 Masks play a huge role in this regard, transforming Link into a Deku Plant, Zora and more in order to bestow upon you the abilities needed to progress. They change the gameplay up ever so slightly, but enough to keep you learning throughout the entire adventure. They’re also utilised beautifully during boss fights, which are all unique enough to remain memorable long after you’ve taken them down one by one. One thing that I immediately loved about Majora’s Mask, especially after just playing Ocarina of Time, is the direction it gives you. There’s never a time where a crucial item required to continue is hidden far away in a completely different region, and I felt far less lost most of the time while pursuing the next objective. You could call it easier, but it took away a lot of the frustration. And the game, subsequently, felt far more focused because of it. The one area where Majora’s Mask mirrors Ocarina of Time though is in terms of how absolutely gorgeous it is. Nintendo has done a fine job of sprucing up the visuals of the old title, pumping it with better looking models, textures and colours. The game shines especially bright when played in 3D, which is an absolute treat on the New 3DS. If you’ve got one with the new C-Stick, or a circle pad on the older 3DS, you can also make use of a free moving camera – something which was missing from Link’s last outing. With it you’re able to take in every little intricate detail of the world Nintendo has poured so much love into, from the poisoned Southern Swamps to the dreary, ominous Zora Cape. Just keep your eyes off the sky – there are few things as scary as glancing up at an evil, grinning moon that is far closer than you ever expected it to be. Ultimately, Majora’s Mask breaks free of its own nostalgia and manages to establish itself as a superbly designed, engrossing experience in today’s day and age. It’s an absolute must-have for any 3DS owner out there – and even more so if you’ve never picked up a Legend of Zelda title before. Majora’s Mask is a testament to the idea that fantastic game design never ages. It’s engrossing while pushy, unique while also familiar and filled with contrasting charm and dread. If you have a 3DS it’s a must-have – and a good reason to pick one up in the first place.